Melissa Culley, who I know as Melissa Newman, is one of those women that I hold close. I don’t talk to her that often but I know her heart and it so echoes my own I sometimes feel as if she is much closer than she is. I can go months without seeing her and when we see each other, it is that hug and short moment together that reminds us that we really love each other and we are bound by an authentic love for Jesus. When Melissa submitted this post to me, I was convinced that God gave it to her for me. It is exactly what He has spoken to my heart and I am so honored to share it with you today. My husband and I are dreamers. We tend to embrace change and look for opportunities to dream big. Josh and I share dreams of serving internationally: preaching, teaching, and caring for orphans. Throughout college I had multiple opportunities to serve in preteen ministry and international missions. In this season, the Lord was stirring kingdom dreams in my heart. My greatest desire was no longer a successful career and the American dream, but to build the kingdom of God around the world. Upon graduating college, I was faced with the toughest decision I have ever had to make. My intention was always to further my education and earn a Doctorate degree. In our current season, my husband and I must admit that we are not living out our kingdom dreams. We are working for a bank and preschool. It is easy to begin doubting God’s plans for us and the desires He has placed on our hearts. Yet, we cannot lose our focus. Sometimes we find ourselves caught in the midst of our routines, living days that seem mundane. But then I am reminded…It is just as crucial that we are faithful in these days as it will be when we begin to live out our God-sized dreams. 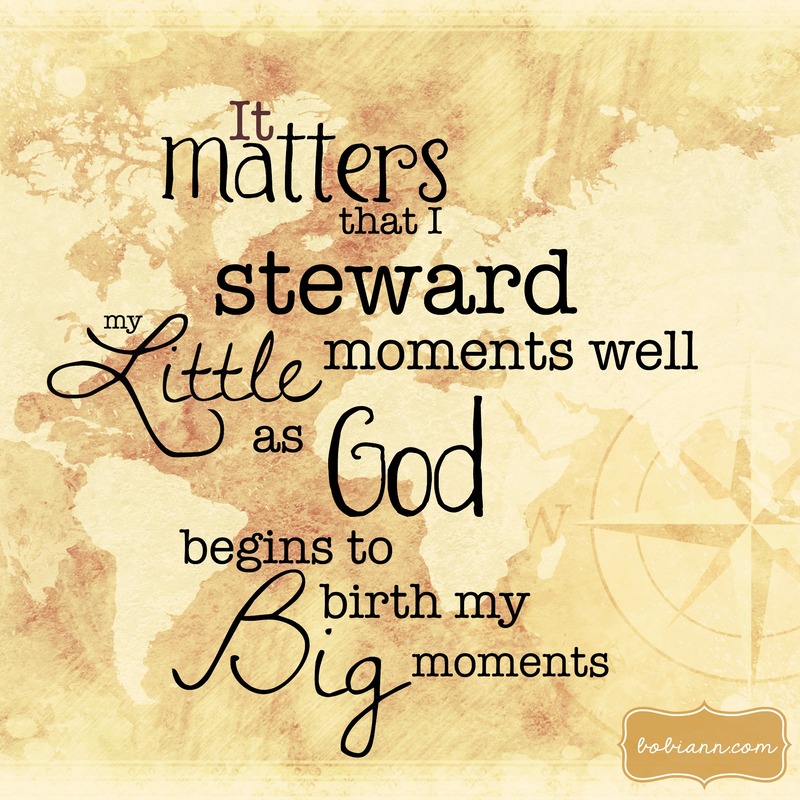 Each teachable moment I have with a child is an incredible opportunity to share God’s grace. Each day Josh spends working earnestly at his job is an opportunity to show the heart of Christ to those around him. The people we meet every day are just as valuable as anyone we might meet anyone around the world. If our hearts and minds are not kingdom-focused now, why should we think that a change in our location or circumstances will change our attitude? We must be faithful stewards of our resources (time, money, talents) here and now. I think about Abraham, the father of many nations. God’s covenant with Abraham in Genesis 17 was that God would make Abraham “exceedingly fruitful.” In their old age and infertility, Abraham and Sarah could not fathom what this would look like for their family. Nonetheless, God had given them a dream and a promise of His faithfulness, and they believed God. In Genesis 17:9-14 God gave Abraham a covenant to keep. After being given the promise of Isaac later in the chapter, Abraham went out to fulfill the covenant. You see, even though Abraham could not imagine his God-sized dream coming true, he knew that God was faithful and he remained faithful to the tasks immediately before him. Much later in Scripture, Jesus talked about the way we steward our financial resources in Matthew 25 (the parable of the talents), but I think it also applies to our stewardship of time and talents. Jesus tells the servants who stewarded well: ”Well done, good and faithful servant. You have been faithful over a little; I will set you over much.” Sometimes we have God-sized dreams conceived in our hearts, but the time is not right to birth them. 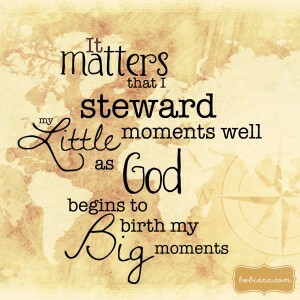 It matters that I steward my little moments well as God begins to birth my big moments. I can be reassured that each day I walk this earth is equipping me for His purposes. God is giving me skills and experiences as well as sanctifying me for His glory. May He be exalted in the seemingly insignificant and the extravagant.